Nope. Not even for £80. Cue elbows galore as they went crazy over a cheap circuit board, next to the 3p tins of beans. People clamoured to the front, they waved them in the air to show how much of a bargain they'd got for a whole £79's worth of gadget. 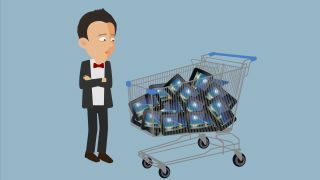 But here's the problem: at these prices, you're far from guaranteed quality, and that's affecting the reputation of everything that's not an iPad. Everyone wants in on the action - Aldi with its LifeTab, Tesco's Hudl and Argos' own 'MyTablet'. Thank God it's YourTablet, Argos. You can keep it. A good distance away, please. Tablets are no longer the preserve of the geek or the show off. Man, I miss those days. Like loads of tech-fans, I was one of the first to get the original iPad. A mate brought it back from the US for me because it was on sale there first. And I LOVED displaying it. People cooed over it like it was a small child. It was my baby. In fact, I used it for a live broadcast I was doing for BBC Breakfast one morning and ended up with the Daily Mail calling into the BBC to ask what it was and where I got it. No doubt smelling the scent of a good 'waste of licence fee payers' money tale.' I paid for it myself, before you ask. But something's changed. The world went for a sleep and when it woke up, the nightmare continued - with the introduction of the budget tab. Budget shouldn't mean 'crap.' It should mean 'cheap but cheerful.' But looking at the selection, all I'm sensing is tech misery. And utter rubbish under the tree. Little Christmas cheer here, folks. Argos' MyTablet is aimed at the 'tweenies.' In other words, those who won't complain. And it's really rather awful, even for the low price. Tesco's Hudl is a worthy contender in the 'value' field but the specs aren't mind-blowing – more acceptable to those that don't know much about technology and are cajoled by the impulse buy for a loved one at Xmas during the weekly shop. And as for ALDI's LifeTab with its 8GB of space - don't even go there. OK, let's go there. Fill that up with a few games and photos and whats left of the 8GB not taken up by the OS will be gone before new year arrives. Are you crazy, Aldi?! That great present is going to be looking more and more like the chains round Bob Marley's ghost quicker than you pull a cracker. It makes me mad because the likes of Argos are RUINING IT FOR EVERYONE. People look at cheap tablets. Specifically Android tablets. And they cross the road. Cheap is good - just look at the Nexus 7 (the old and the new version) or the Kindle line. They're great little belters – and both of which are quite affordable. Nobody is saying go out and buy an over priced iPad. Just buy sensibly. Don't impulse buy - which is what many will do with no research or tech knowledge to back that up. Save up a bit more and go for a trusted Nexus or Kindle Fire… the waters are too murky when you hover around the £100 mark for a tablet. A tablet's for life, not just for Christmas. Or something like that. Pick wisely.